Mix together the natural yogurt, chilli powder, mixed herbs and chopped garlic. Place the chicken thighs into a large mixing bowl and mix well until combined. Allow to marinade for up to an hour to allow the flavours to infuse and develop. 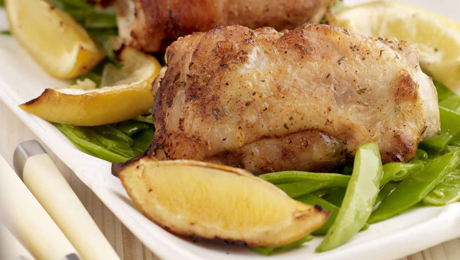 Place the chicken thighs on a baking tray lined with baking parchment. Scatter the lemon wedges around the chicken, cover the tray with tin foil and bake in the preheated oven for 45 minutes. After 45 minutes reduce the heat, remove the tin foil and bake for an additional 20-25 minutes to crisp up the skin of the chicken. Meanwhile mix together the potatoes with the mixed herbs, chilli powder and oil in a large bowl. Once the potatoes have been sufficiently coated, transfer them onto a baking tray lined with parchment and cook in the oven with the chicken for 35-40 minutes until they have softened on the inside but still crispy on the outside. If you wish you can turn them during the cooking process. Meanwhile heat a wok with a little oil and quickly stir fry the sugar snap peas for 2-3 minutes until softened. Serve immediately with the spicy potatoes and the chicken.